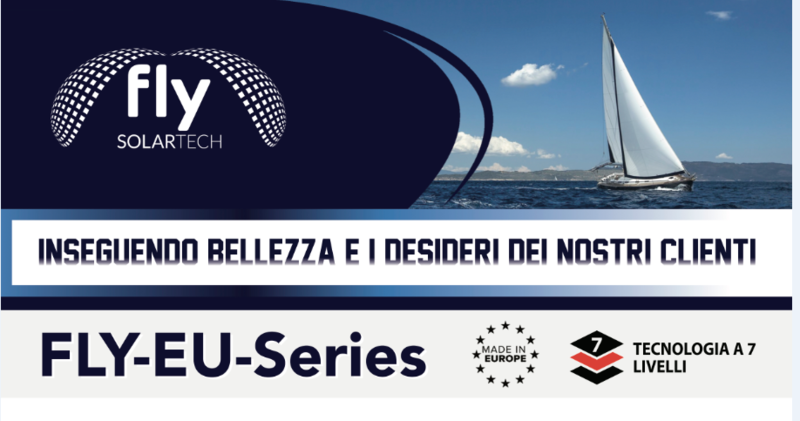 We are delighted to announce the upcoming production of the new series of 7-layered flexible prismatic panels known as FLY-EU, which will complete the already extensive offer of flexible photovoltaic panels designed for nautical applications launched on the market through the e-commerce platforms at the beginning of this year. The peculiarity of this new line of products, which places just one step below our current top line SGM-S2-FLY, consists in maintaining the 7-layer structure and upper surface made of ETFE with the further implementation of dual-prismatic technology that guarantees an efficiency increase due to better absorption of solar radiation given by the greater reflection surface available. To meet any requirement in terms of application, this new line will consist of both mono and polycrystalline modules, also characterized by the implementation of extra thin junction boxes to limit the size and 4 to 8 eyelets on the edges of the module to facilitate the installation on the host surface. Moreover, all FLY-EU panels are entirely assembled in Europe with the usage of German solar cells, detailing the high quality of the product. As you can personally check in the download section of the website, technical data sheets covering all power cuts of the new FLY-EU panel series are already available for download in PFD format. Further announcements will be made in the coming days about the publication of price lists reserved for the different categories of buyers. With the aim of providing the best service to all interested parties, we kindly invite you to contact our customer service in advance, providing the type and the quantity of panels wanted in order to allow a more organized management of the product distribution once production finishes and the goods will be arrived at our warehouse.